The drama provided an eloquent snapshot of the political forces over immigration tearing at the cohesion of the Republican Party. It was not clear what will happen next. But with Trump reveling in the embrace of his adoring, partisan crowd, it’s quite possible that he returned to the White House with his base-baiting instincts replenished. To embrace the agreement reached in tortuous congressional negotiations, Trump would have to try to spin a clear loss as a win — a tactic he seemed to hint at during his rally. But details were already filtering out of the talks in Washington about the shape of Monday’s deal. It is hard to believe that the President wouldn’t have been told if the outcome had matched his demands that triggered the longest government shutdown in history late last year. He also declined to go into details on the deal in an interview with conservative Fox News pundit Laura Ingraham, who has a proven track record of influencing him on immigration matters — conducted before his rally. “A lot of things have changed. I can’t go into detail — I just heard it very quickly coming over to see you,” Trump told Ingraham. “While the President was giving a great speech in El Paso, Congress was putting together a bad deal on immigration,” tweeted House Freedom Caucus co-founder Rep. Jim Jordan, an Ohio Republican. Conservative media coverage of the deal will most certainly be a crucial factor. If the reviews stink, the President could be emboldened to go ahead with a third way forward — flexing executive power to fund the wall. At his rally, he appeared to keep that option open too. Monday night in El Paso also offered a possible taste of things to come. Former Rep. Beto O’Rourke, who hails from the area and is considering a 2020 presidential bid, headlined another rally so close to Trump’s event that attendees could catch a glimpse of the President on a jumbo screen outside. Meanwhile the President remained unrepentant, repeating his false claim, which has even been debunked by El Paso Republicans, that a section of border wall was responsible for a huge slump in violent crime in the city. “They’re full of crap, when they say it hasn’t made a big difference,” Trump said at the rally. Should Trump declare a national emergency to reprogram funds to build the wall, he could quickly run into legal roadblocks and worry Republican senators, who fear how a future Democratic president could use such a sweeping precedent. But Trump would be able to keep alive the crusade for a wall and mine vehement Republican support for the project for political capital. One option for the White House would be to accept the congressional deal — but then seek to use executive power to find other funds elsewhere to erect new border barriers unilaterally. 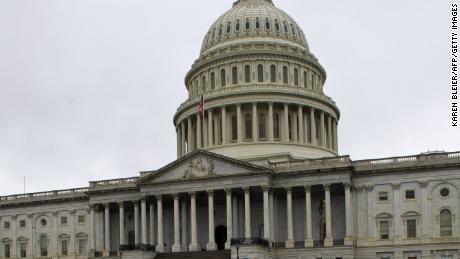 A full rundown of the agreement between Republican and Democratic lawmakers from the House and the Senate is not yet available. But the first signs are that it falls well short of Trump’s demands, which sparked the longest government shutdown in history in December and January for a 200-mile stretch of wall or steel fences on the US-Mexico border. Sources said the blueprint allows for $1.375 billion in border bollards but includes a prohibition on concrete walling and permits only “existing technologies” to be used in frontier barriers. Still, Democrats did back down on a demand for a cap on the number of places in detention centers for undocumented migrants, which had stalled the talks over the weekend. The party had sought the restrictions in an effort to handcuff Trump’s zero-tolerance policy of detaining undocumented migrants — even those without criminal records. The coming hours will be crucial for hopes that the President could sign the deal. As the run-up to the start of the government shutdown in December showed, he can be heavily influenced by how events play in conservative media. But Congress has done its job. “It’s one minute to midnight. They have narrowly averted what would have been a real embarrassment,” said David Gergen, a senior CNN analyst who’s a former adviser to multiple Democratic and Republican presidents. “We ought to thank them for doing that … and say, ‘Mr. President, the next move is up to you,’ ” he added. CNN’s Manu Raju, Phil Mattingly, Jeff Zeleny and Dana Bash contributed to this report.